There should be a rule that if the mom gets sick then no one else is allowed to get sick as well. Just once I want to get sick all by myself. I want my family to soothe my fevered brow, bring me countless cups of tea, and insist I not get off the couch. I'm living in a dream world, aren't I? Instead what happens is that the cold (yes, we are only talking about a cold but, in my defense, it is a particularly nasty one) starts with my daughter, moves on to my son, and then hits my husband and me at the same time thus leaving no adult to care for the everyday concerns. We both feel miserable, we both want to sit on the couch, we both get grumpy. Don't you wish you knew me in real life now? We sound so appealing. My daughter went off to school today saying that she thought she might be getting another sore throat. Do you think she might be starting a whole different cold? The mind boggles at the misery. But right now I am sitting on the couch, I have a stack of books next to me, and I know my husband will make me tea if I ask him to. I am just going to ignore the five loads of clean laundry that need to be folded, the five million stuffed animals on my living room floor, and the dust bunnies under the coffee table .I am also going to ignore the slightly panicky feeling because my schedule is messed up for the week. I am going to read my books and relax until the kids get home and I have to return to real life. What do you read when your head is so stuffed up you can't focus? If you are me, you do a lot of rereading. Right now I am reading The Talisman Ring by Georgette Heyer. I always read Heyer when I am sick. There is nothing like Regency England, witty comebacks, and fraught love affairs to make you forget your misery. I have The Toll-Gate on the pile as well. I haven't read that in a long time. I also have Gaudy Night by Dorothy Sayers. Peter Wimsey will brighten any day. I can pretend I am punting down the river in Oxford with him, looking frail and interesting instead of red-nosed and puffy-faced. Of course, the witty comebacks would be mine in this case. I would enthrall him with my intelligence and Latin tags. (I think I might be feverish) Lastly, I have All Creatures Great and Small by James Herriott. I read these books so many times when I was younger that I practically have them memorized and I had to stop reading them for a while. I just recommended them to my animal loving daughter so I thought it might be time to pick them up again. His books always make me want to travel to Yorkshire. I can plan an imaginary vacation when I need a break from reading. What do you read when you are ill? I hope you feel better and I'm glad you're ignoring the laundry in favor of rest and reading. There really is no break for moms, no sick days even. I hope the books help you feel better soon! Whenever I'm sick I like to read fantasy, something that will engross me and help me pass the time and forget about what is really happening in life. Books always make me feel better and ignoring the laundry definitely helped. I don't know much about the fantasy genre but it does sound like it would be a good way to escape from reality. actually when I have a cold I also have a massive headache and can't read:( get well soon! Oh, that just makes a cold so much worse. Thankfully, I avoided the sinus headache so I have been able to read to my hearts content. Georgette Heyer definitely. I also like Brother Cadfael because although well written books they are comfortingly predictable which is what I need when I'm sick. I want to go to another place (I rarely read contemporary fiction even when I'm well) and know that the right people will marry each other and the truly wrong people will get their come-uppance and Cadfael never fails me. If I feel sorry for myself I read 'Sense and Sensibility' and remember I am not Elinor, all shall be well in a few days, and the Steele sisters will not come to visit. I hope it all clears up soon and that daughter doesn't bring home any new strains. Oh, Cadfael, I haven't read him in years. I think it might be time to reread his stories. I used to own a few but I think they are up in the attic with all the other books that won't fit on my shelves. Jane Austen is always a good idea. The idea of the Steele sister coming to visit while I am ill is truly horrifying! I hope you feel better soon. I comfort read like you. For me, that means Lilian Jackson Braun, M.C. Beaton, Agatha Christie and James Runcie. Hmmm, I don't think I have read James Runcie. I am always glad to have a new author to check into. I'm so sorry to hear you are sick. I like the books you chose, though I've never read Georgette Heyer. My mother lent me Heyer's Frederica. Is it any good? 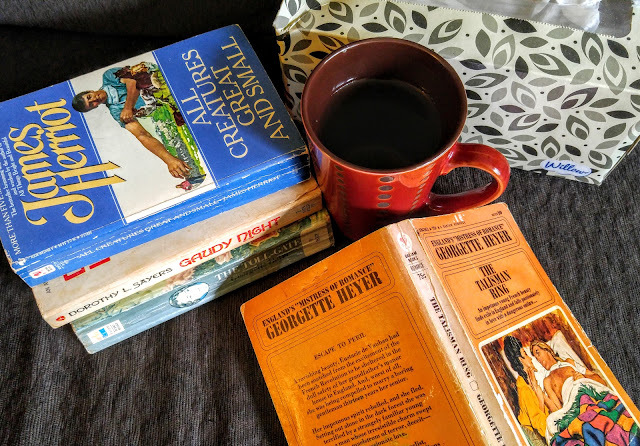 Oh yes, I think so but I have a soft spot for Heyer's novels. They are frothy and charming but they are well-written froth which makes all the difference. Sorry to hear that you're sick. Fingers crossed, I haven't had a cold for a very long time but I would also choose Jane Eyre, Gaudy Night & probably Josephine Tey's Daughter of Time as my sickbed books. Get well soon. I just reread The Daughter of Time last week. Just as enjoyable as the last five million times I have read it. My kids go back to school and we all get sick. It happens every September. Schools are just giant incubators for germs. Hello Jennifer, Thank you for visiting my blog and leaving a comment! Here's me returning the favour. Sorry to hear you're not well, and I hope your cold passes quickly so that you can catch up with everything you want (or need) to do. Heyer is great reading when one wants something light, funny but without being too daft! I love her sense of humour. As for planning an imaginary vacation in Yorkshire - well, you've come to the right place! I have family in Yorkshire and spend my summer (or other) vacation there every year, it is my home away from home. I actually have been reading your blog for quite a while now and I thoroughly enjoyed your posts about your trip to Yorkshire. It is definitely on my list of places I must get to sometime soon. I don't tend to read much when I'm sick. I watch movies instead. And I'm all about escapist, violent, and frothy movies when I'm sick -- no deep dramas, thanks! Give me superheroes and mysteries and westerns and musicals and let my brain float out of my body. This is due to not getting to watch more than about one movie a week as a kid except when we were sick. If we were sick, we could watch as many movies as we wanted -- Dad would haul the TV out of his and mom's bedroom and put it in the living room, I would lie on the couch, and I could soak up stories to my heart's content. Don't get to do that much anymore when I'm sick, with three kids to wrangle, but when I had strep throat three times in one year a while back, I did get to hide in my room and watch movies on my laptop. Strep throat three times in one year sounds awful. You deserved to hide in your room and watch movies. I don't watch much TV when I am sick, it tends to give me headaches but things that make your brain float out of your body sound like just what the doctor ordered! Yeah, we still refer to it as The Year of Strep. All three of my kids had it twice each, and kept giving it to me, the sillies.